Carly Shay and her pals Sam and Freddie are back with the all-new Nickelodeon Home Entertainment DVD release, iCarly: Season 1, Volume 2. The groundbreaking show – the first scripted series to incorporate kid-created original content – stars Miranda Cosgrove as Carly, the host of an incredibly popular teen web show. 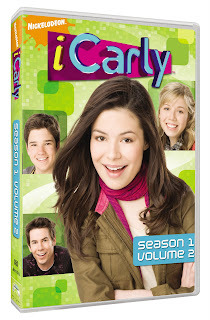 The two-disc DVD follows Carly, Sam and Freddie as they deal with all the craziness of school, growing up, and crankin’ out the best web show out there on iCarly.com! Created by Nickelodeon Home Entertainment and distributed by Paramount Home Entertainment, iCarly Season 1, Volume 2 will be available April 21, 2009, for the suggested retails price of $26.99. iCarly Season 1, Volume 2 features 12 new-to-DVD episodes, along with exclusive Behind-the-Scenes extra features that show fans all of the off-camera fun! The set also includes a Behind the Slime with the Cast of iCarly featurette as well as the pilot episode of the new fan-favorite series, True Jackson, VP. iCarly's biggest fan, Mandy, is invited onto the show as a one-girl studio audience. Mandy turns out to be more of a stalker than a fan and the kids have to get rid of her. Meanwhile, Spencer finds out that his new band is just letting him play drums so they can practice in the apartment. Carly invites Spencer's art hero, Harry Joyner, to take a look at Spencer's work. When Harry calls Spencer's work amateurish, Spencer feels like his life has lost its purpose. Carly decides to show Spencer's sculptures on iCarly, but even positive reaction from iCarly fans isn't enough to cure Spencer's blues. Spencer won't be able to work again until Harry Joyner praises his work. Sam gets a boyfriend, and the two are inseparable. But when the relationship starts affecting iCarly, Carly and Freddie know they have to do something. Meanwhile, Spencer is attempting the painstaking process of creating a claymation movie, one frame at a time. Carly makes Sam a one-of-a-kind iCarly shirt to commemorate the anniversary of their friendship. But when Sam trades the shirt for concert tickets, the two friends find themselves in a fight. Meanwhile, Spencer builds a fish-feeding machine so that he'll never forget to feed his fish again. Carly, Sam, and Freddie are invited to Daka headquarters where they are offered a large sum of money to endorse Daka’s new shoe, the Tech-Foot, on iCarly. But the shoes turn out to be terrible. With pressure from iCarly fans, angry about spending their money on the horrible shoes, Carly, Sam, and Freddie have to figure out a way to get out of their contract with Daka and get refunds for all their fans. Meanwhile, Spencer explores different options for transportation after falling asleep on a bus and ending up in Canada. Sam gets detention on the night of iCarly’s 50th web show spectacular. Unable to do their normal webcast, Carly and Freddie do their best to get detention too so they can do the show from inside detention with Sam. Spencer builds a ten-foot-tall cup of coffee, then accidentally drops his cell phone in and has to dive in to find it. After watching a segment on iCarly that showed a man who sells illegal copies of movies, two detectives decide to use Carly and Spencer's loft for a stakeout. Spencer, who is busy making all the food for Socko's birthday, is horrified to find that one of the detectives is his childhood bully. As the stakeout drags on, the kids decide they have to do something. Meanwhile, Freddie loses a bet with Sam and now he's going to have to get a tattoo. A big time producer wants to make iCarly into a TV show. But Carly, Sam, and Freddie are soon upset to learn all of the big changes the producer wishes to make. Meanwhile, with the kids at the TV at studio rehearsing all the time, a bored Mrs. Benson begins mothering Spencer. Carly learns that because of her web show she's been given the opportunity for a full scholarship to the elite private school, Briarwood. If she does well in an interview with the headmaster, she's in. Carly's not so sure about it, but Sam and Freddie know they don't want her to go, and they might have to make sure she doesn't. Meanwhile, Spencer creates a mini-golf course that becomes hugely popular after being featured on iCarly. Freddie's in need of some guy time, so he tags along with Spencer to go fencing. Freddie's a natural, but things get complicated when Spencer gets him involved in a match with the amazing Doug Toder. Meanwhile, Carly has to plan a dinner for her weird relatives, the Dorfmans, and with Spencer busy fencing, she might not get much help. Sam reveals that she has never read a real book, and a bet begins between her and Freddie: can Sam finish a book? When their friend Gibby is too shy to ask out the girl he likes, the gang decides to make him and his crush contestants in an “iWin A Date” segment on the web show. When two of the contestants don’t show up, Carly has to step in to play. Will Gibby choose his crush or Carly as his mystery date? Mrs. Ackerman, the gang’s teacher, goes through a rough breakup with her boyfriend, causing her to quarrel with her students. A visit from Spencer to sort out the dispute turns into a date. How will Spencer deal with the amorous advances of his sister’s teacher? A show-within-a show, iCarly follows its characters Carly and her best pals Sam (Jennette McCurdy) and Freddie (Nathan Kress) are followed on and off webcam as they create their webcast -- and grapple with everyday tween problems and adventures. Kid viewers who’ve connected with the TV characters interact with them at real-life companion website http://www.icarly.com -- and upload original videos that may be used in the show ere perchance to wind up on TV. They also check out highlights of the latest webcasts from the series – plus additional footage not seen on-air -- read weekly character blogs, send e-mails, ask questions, post comments, participate in polls and more. The popular site averages 2.8 million monthly visitors (source: Omniture SiteCatalyst 2Q08). iCarly comes courtesy of executive producer/creator Dan Schneider’s (Zoey 101, Drake & Josh) Schneider’s Bakery. My kids LOVE most Nickelodeon shows but I can usually count on catching them watching iCarly daily! They loved this DVD and have played it approximiately 4 times already! Their favorite episode was the iGot Detention episode! We all thank Bender Helper Impact for providing us with this DVD! Please take a moment to check out my sponsor! *My children and I were provided with a copy of this DVD to review by the above-named sponsor. We were not paid to review this item, nor were our opinions influenced in any manner.